I love this s item! I often wear tops that have “sparkes” on them that can scratch the back of my guitar-which I recently had re-French polished-so I always draped a hand towel over it-which wasn’t too efficient. This cover takes care of that whole issue! I tend towards OCD when taking care of my guitar-LOL. There's no information about composition of material or how to wash it. a while ago I have been reluctant to use this as I do not prefer to put it on and wrap it over almost 50% of the guitar top and affect the performance. However, very recently, I have finally received my first expensive concert grade guitar and I've figured out a fantastic way to use this all the time for the guitar. I did not wrap it over the guitar while playing however, it is wrapping over on the guitar sides, and it is still wraps very securely while playing the guitar. In fact, I even have the Barnett guitar support attach on the guitar (not on top of the velvet but wrapping along the sides of the support) and it still wrap securely on the guitar. Since the velvet is not wrapping over the guitar top, it is not able to protect the area where the right arm is resting on while playing the guitar. I put another cloth on the area and the velvet wraps over it to hold it in place securely and my right arm will rest on the cloth which not only protects the guitar but also adding so much comfort for my right arm! 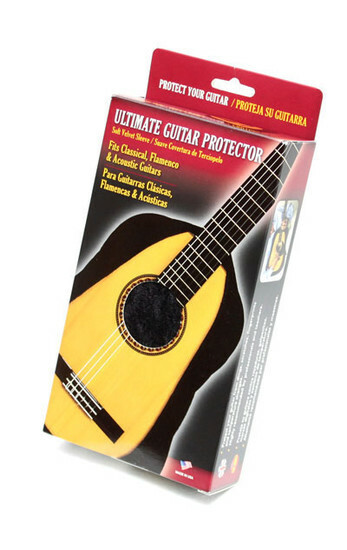 This protector is protecting my expensive guitar at all time, when I'm playing the guitar I would use the way as mentioned above, and when in the case, I will remove the Barnett support and wrap the velvet over the guitar top and put the guitar into the case!! I will buy another of this in the future and this is a must accessories for me now! Even if I'm going on stage, I will still do this! My guitar will be fully protected, my body flesh will never in contact with the guitar forever! I think I can easily sell my guitar in many years later with the condition as new! Q: Is this safe to use on nitrocellulose finishes? Yes, the cover should be safe to use with nitrocellulose finishes.